This article is the first of a three part series exploring Tanjung Puting National Park. The proboscis monkey is amazingly cute, though of course beauty is in the eyes of the beholder. Several thousand of these 'dutch monkeys' make their home in the jungles of Borneo, living off leaves, seeds and unripened fruit. 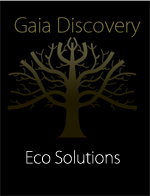 But, Simon Pridmore reports, their natural habitat is threatened by illegal mining and logging. Kumai, Kalimantan, Indonesia, February 2012. When you travel to Borneo, you do not expect to be greeted by the sight of skyscrapers lining the waterfront of a riverside town. On closer inspection you see that these towers are largely windowless and they emit a cacophony of noise from dawn to dusk. These are not for the townspeople: they live in spotlessly clean tin shacks with flower-lined balconies at the water’s edge. These skyscrapers are for the birds: thousands upon thousands of swifts that build their expensive nests inside the fortress-like concrete blocks. Thirty minutes in a taxi from Pangkalan Bun airport has brought us to Kumai, a port that shares its name with the broad, fast-flowing and muddy brown river that runs generally north to south through the lower section of Central Kalimantan to the Java Sea. Our viewpoint for Kumai’s improbable skyline is a two-storey riverboat called a “kelotok” that will be our home for the next four days. It will be taking us on a journey through Tanjung Puting National Park, home to large populations of monkeys and orangutans, threatened elsewhere in Kalimantan but apparently thriving here. On board are the four of us and four crewmen, a guide, a cook, the captain and a boat boy. They will live on the lower level of the boat; we will live on the upper deck. We head south towards the ocean then turn east on to the Sekonyer River that runs along the northern edge of Tanjung Puting. Nipah palms, beautiful in their symmetry, line both sides of the river and beyond we can see light tree cover becoming more dense as the river narrows and we glide deeper into the forest. Technically, only the area to our right is national park. To the left, the animals are not protected but evidently they do not know where the line is drawn and we soon come across our first tribe of proboscis monkeys perched in an enormous shady tree on the left bank. 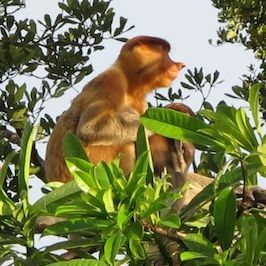 These are the comically dubbed monyet belanda (“Dutch monkey” in Indonesian) proboscis monkeys, so named because of their pale fur and the substantial red “drunken” nose sported by large adult males. Nature has spared the females the embarrassment of such a protuberance and endowed them instead with a much cuter pointed Pinocchio nose. Proboscis males use their huge fleshy noses to attract mates. According to National Geographic, these outsize organs create an echo chamber that amplifies the monkey’s call, impressing females and intimidating rivals. The group gazes on passively as our boat approaches, the engine idly ticking away to keep us steady against the current while not spooking the monkeys. There are thirteen of them, including a few small babies. A couple are sitting in a frangipani tree near the water’s edge and remain calm even though we are very close. Apparently, they like to live above the river for security and are very good swimmers, crossing and recrossing in groups from time to time. With the advent of water-borne tourism in the park, they have become quite used to boats and people. Ambo, our guide, tells us that they seem to take advantage of the presence of the boats to make their river crossings, having learned perhaps that boat engines scare the crocodiles away. 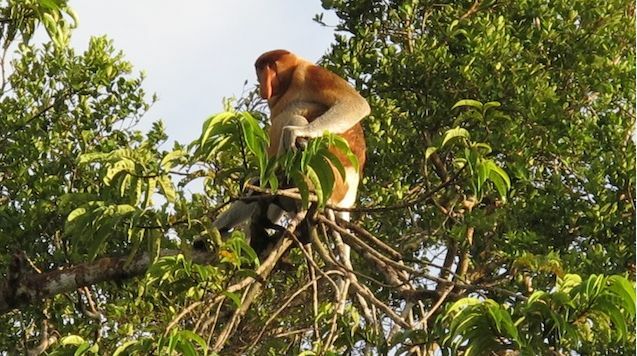 The best time to see the proboscis monkeys is in the late afternoon when they abandon their daily foraging and return to the trees at the river’s edge to sleep. A tribe is usually made up of two large males, eight or so females and some babies. As younger males grow and become sexually active, they are expelled from their tribe and join male-only fraternities. As we continue into the dusk, we notice the foliage at the side of the river has changed and the curtain of nipah has been replaced by pandanus. We pass a couple larger boats coming the other way with a dozen or more tourists on board and our guide explains that they are from the Orion, a large cruise ship that has moored at the mouth of the Kumai. The visitors come up the river by speedboat in the morning to view the orangutans at one of the feeding stations then return at a more leisurely pace in the afternoon. When it becomes too dark for the captain to dodge floating logs, we settle in for the night next to the pandanus and eat by candlelight, anti-mosquito coils glowing at our feet. We sleep in silk bag liners (which we brought with us) on mattresses arranged on deck, behind nets slung from the roof to shield us from insects. A female proboscis and her baby. Only a few thousand 'Dutch Monkeys" remain in the wild, all in the forests of Borneo. The noise of the forest soothes us to sleep although not all the nocturnal activity sounds benign and we occasionally wake up with a start as the peace is shattered by a burst of aggressive roaring, crashing of foliage, panicked squeals and hoots. Then silence descends once more. In our minds, the image is seared of a clouded leopard stalking its prey but it could just have been a proboscis monkey falling off its branch! At dawn, we wake slowly as our minds try to grasp why the first sight that meets our eyes is a wall of green foliage curved around a small bay of smooth coffee-coloured water. We move off and shortly afterwards turn off the Sekonyer onto a smaller tributary to make our way deeper into the Park. The change in water colour and quality is instantaneous. The stream here is clean and clear and you can see the roots of the fringing pandanus through the tannin-tinged waters. The chugging rhythm of the kelotok engine is hypnotic and lulls you into a reverie as the forest and river drift gently past. This is a very relaxing way to travel. There is plenty of space for four people to stretch out and read or just pass the time staring at the scenery and there are shade and sun options to cater to both half-naked sun-worshippers and the big hat and sun block group. Occasionally, we come across local residents at work and play, a fisherman with his small canoe tucked securely into the bank or an elderly couple paddling their way down the river.